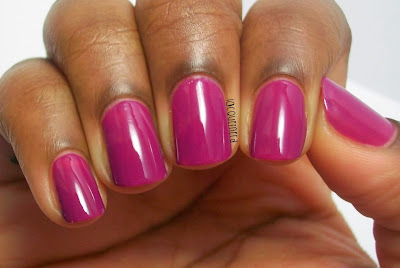 Lacquernerd: Sally Hansen-Cherry, Cherry Bang, Bang! I wasn't going to do a Saturday post today, but I'm still trying to figure out what days would be best for me to post. Currently, I post on Monday, Wednesday, and Friday, but I hate having the gap between Saturday and Sunday. I'm also messing around with the time as well. If anyone has any suggestions as to what times are best to post, let me know! For today, I have a swatch of Sally Hansen's Cherry, Cherry Bang, Bang! I used this as a base for a nail art design that I did a few days ago, which will be posted soon. I've worn this before once, but I forgot how pretty this color is! Cherry,Cherry Bang,Bang! is a purple with magenta undertones (purgenta? magenple? lol). This is two coats without a top coat. It's a little bit darker than what's showing in the photos, but I think it's because of the shine from the light. This color is a part of the Sally Hansen Complete Salon Manicure collection. I bought this on sale at CVS for around $3-4. I remember that it was 50% as well. Typically, these polishes run around $7-8, but I usually see these polishes on some sort of sale during the year. If you want to save some money for a good polish, I'd recommend getting them on sale. The formula was great to work it. I really had no problems with it. I also had no problems with the application. The Complete Salon Manicure polishes have a nice wide brush, which I love and makes it easier to apply the polish. Overall, I would recommend buying this polish. Like I said earlier, these are a bit expensive, so I'd recommend getting them on sale if you're tight on money. I think it's a nice color to wear for the fall and winter, since it's darker but bright polish (if that makes sense lol), but you can wear it anytime of the year. Love this color, it looks beautiful on you! I have quite a bit of the Complete Salon Manicure polishes and I've never been disappointed! The brush & formula are amazing. Thank you! I have a few of these myself and they're all great. I really like this brand. I feel like I don't see this particular shade of pink often enough, which is too bad. This is a great color on you! Thank you! Yeah, I don't see this shade often either.